It has taken weeks to tackle the most deadly and destructive wildfires in California history, a series of fiery eruptions now being called the October Fire Siege. Since the first outbreak on Oct. 8, Northern California has seen a total of 250 fires that burned over 245,000 acres and destroyed 8,900 structures. Forty-three deaths have been reported (as of Oct. 31), and the 100,000 evacuated residents are just now making their way back home. For some, that means returning to piles of ash and debris—a scene of complete desolation with only chimney structures enduring. Relief efforts are underway, and residents are looking to the government for financial assistance, as well. Over 3,000 fire victims have applied for individual assistance from the Federal Emergency Management Agency (FEMA), which has provided displaced Californians with $6 million in rental funds and other aid. In addition, the California Fire Foundation is providing financial assistance to victims through its Supplying Aid to Victims of Emergency (SAVE) program. Real estate brokerages and lending institutions are coming together to help the affected communities, as well. 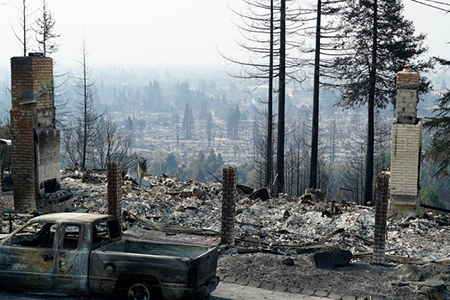 Keller Williams is using its charitable arm, KW Cares, to provide donations and financial assistance to real estate agents impacted by the tragic fires. Wells Fargo has contributed a total of $1 million to relief efforts through the Red Cross, Salvation Army and local non-profits that will help with rebuilding efforts. The future of real estate in these areas is still unclear, and government declarations have halted transactions even for homes that were unaffected by the fires. The Federal Housing Authority is enforcing mandatory damage inspections for all homes in Presidentially-declared disaster areas, including Butte, Lake, Mendocino, Napa, Nevada, Orange, Sonoma and Yuba counties, before lenders can give out loans. This is stalling escrow, refinances and reverse mortgages. Other government institutions are easing restrictions to accommodate for delays from fire damage and evacuations. The Department of Housing and Urban Development (HUD) is granting immediate foreclosure relief: a 90-day suspension on foreclosures of FHA-insured home mortgages.Fannie Mae and Freddie Mac have enacted similar policies. These will delay foreclosure for tens of thousands of homeowners. HUD is also offering forbearance and loan modification options. Borrowers from FHA-approved lenders may be eligible for 100 percent financing, including closing costs, through FHA insurance (HUD’s Section 203(h) program). Meanwhile, HUD’s Section 203(k) loan programs allow homeowners whose homes were destroyed to finance the purchase of a new home. Those with damaged homes can refinance the rebuilding or repair of an existing single-family home, as well. Representatives in the affected towns are working together with the Environmental Protection Agency (EPA) to ensure that homes are safe for re-entry. The EPA is searching residential properties in the Coffey Park, Soda Canyon and Silverado neighborhoods for hazardous waste, corrosive or toxic materials and products that can catch fire or explode, which require special disposal methods. The already tight inventory in California will pose a problem when it comes to finding new homes for the displaced population.